Wal-Mart, the world's biggest retailer, has decided to sell more organic food and has asked its suppliers to increase their range of products to meet demand. Organic products will become cheaper, selling for about 10% more than non-organic foods, it said. Currently organic goods carry a 20-30% premium. Wal-Mart told the New York Times that it wanted to democratise organic foods. 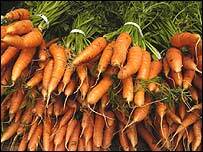 Still only 2.4% of total sales, the organic food industry is worth some $14bn (£7.4bn) a year, the paper said. 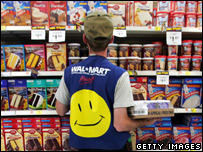 Growth is forecast at about 15% a year, but could well outstrip that target, Wal-Mart predicted. The move to be more organic will take place this summer, the New York Times reported. "In the past weeks, Wal-Mart has begun to double the organic food offerings in all of our Supercenters and Neighbourhood Markets, making organic alternatives available to more consumers around the country," a spokeswoman told the BBC. The shift will not be without controversy, however. While many observers will applaud a healthier and larger choice for consumers, other will complain that mass manufacturing goes against the very concept of organic production. But Bruce Peterson, head of perishable food at Wal-Mart, told the paper that the move into organic was aimed at changing the way consumers view the retailer. "Consumers that gravitate to organic products don't always think of Wal-Mart as a top-of-mind destination to pick up those products," he said. "We want to let customers know, 'Hey we're in that business'," he added. As a result, Wal-Mart has been asking suppliers such as Kellogg, Kraft, General Mills and Pepsi, to ensure they have a broad enough range of goods to offer. According to the New York Times, Kellogg is developing an organic version of its Rice Krispies, Frosted Mini Wheats and Raisin Bran, while Kraft is looking at a new version of its macaroni and cheese. While new organic versions of well-know foods and brands may promise greater profits for a company, some observers are less convinced about their supposed health benefits. "It's better for the planet, but not from a nutritional point of view," Marion Nestle, a professor of nutrition, food studies and public health at New York University told the New York Times. "It's a ploy to be able to charge more for junk food." What does organic food mean?